Thank you for your dedication to UWL! Last Day to Drop 1st Half Course without a "W"
Doing What's Best for Our Kids! Gaming extravaganza open to UWL and the community. Stem Cells, Cancer, & Chemistry: Is it so Bad to be Fly-Brained? There will be a Question and Answer Panel from 12-1 p.m. Hear directly from a panel of employers and scientists about how to prepare for a career in science. Following the panel, from 1-3 p.m., students will be able to talk one on one with employers and scientists from regional organizations about career opportunities. Feel free to arrive any time for this part of the event. This is a unique networking opportunity where nearly 20 employers will be recruiting for their organizations. 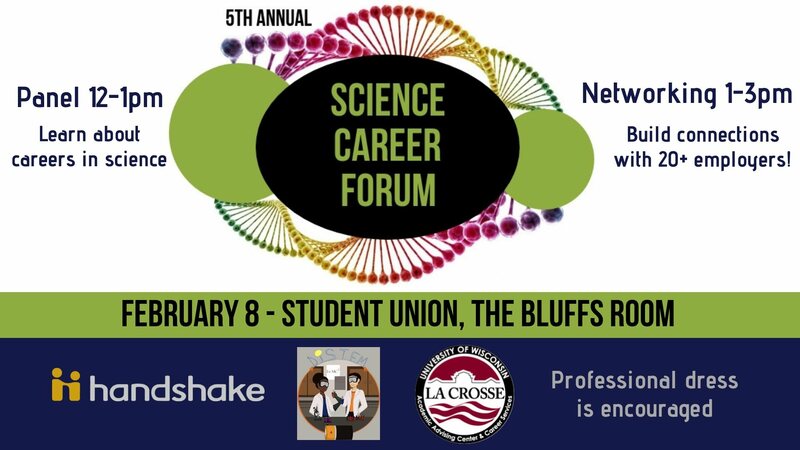 It is a great opportunity to network with employers who may not be at the general career fair and who are recruiting specifically for students in science-based careers. No pre-registration required! Get more information through Handshake. To request disability accommodations (accessible seating, interpreting, closed captioning, FM systems, etc. ), contact Rebecca Lee at rlee@uwlax.edu or 608.785.8362.